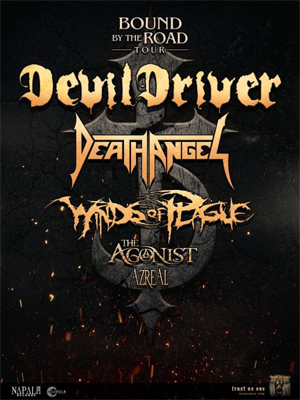 SoCal groove metal heavyweights DEVILDRIVER will headline a 19+ date North American tour, dubbed the "Bound By The Road" tour, beginning February 8, 2017 in Santa Ana, CA. The tour will feature support from special guests and heavy metal frontrunners DEATH ANGEL, WINDS OF PLAGUE, THE AGONIST and AZREAL. The upcoming "Bound By The Road" tour follows the band's most recent public performance at Ozzfest Meets Knotfest, where they shot their newest music video for their latest album's title track "Trust No One"